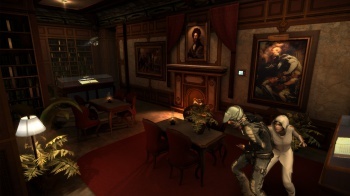 Republique Kickstarter backers are being asked to buy the game and then seek a refund because of Apple's restrictions on free game codes. 11,611 people backed Republique on Kickstarter and that means that 11,611 people are entitled to a free iOS version of the game. That's a problem for developer Camouflaj, however, because Apple keeps a very tight lid on the number of promo codes it allows a studio to give out. The studio has thus begun to manually gift the game to its backers, but that strategy is only effective for customers in the U.S. thanks to another App Store rule that prohibits gifting to people in other regions. It thus finds itself in the very awkward position of asking international backers to purchase the game at the regular price of $5, with the promise of a refund once they've done so. Camouflaj has sent a new survey to backers "designed soley for iOS fulfillment" and is trying to work out a way to issue $5 refunds through Amazon, the Kickstarter payment provider. "In the unfortunate event that we can't, we will find another way to get you $5; it is the Internet after all," it said in an update sent to backers. "If this occurs, it means there will likely be another update and, I cringe typing this, another survey. In the meantime, International Backers: We ask that you trust Camouflaj will refund you $5 and go ahead with purchasing the game through normal means." It's not a huge amount of money - honestly, if you can't afford to lose five bucks then you probably shouldn't be giving money to Kickstarters anyway - but on principle, it's an ugly situation. It wouldn't kill Apple to introduce a little more flexibility to the App Store but the real responsibility lies with Camouflaj: I don't think there's any intentional misbehavior afoot, but it should have been aware of this looming roadblock (and dealt with it) long ago.